Peach finds a treasure map in the town of Rogueport, and Mario sets out to recover the treasure. But Peach is kidnapped by an alien race known as the X-Nauts who are also searching. Mario must track down the Star Pieces that will unlock the mysterious Thousand Year Door where the treasure awaits. Mario teams up with partners, each with their own special moves that help in battles and to solve puzzles. Mario also learns Paper Attacks, curses that allow him to use his paper appearance to transform into paper planes, slip through narrow cracks, and so on. You can also take control of Peach and Bowser on their own, separate adventures. In Petal Meadows village there is a little mushroom boy who will talk to you at great length about his favorite games. 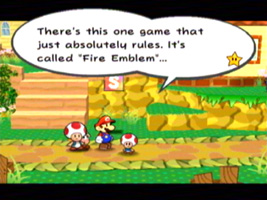 He first tells you about Fire Emblem on the Game Boy Advance. Come back later and he'll tell you he's playing the original Paper Mario on the Nintendo 64. On the final two visits he tells you he's been playing Paper Mario: The Thousand-Year Door, and he even completes it before you do and tells you the ending is "worth it". 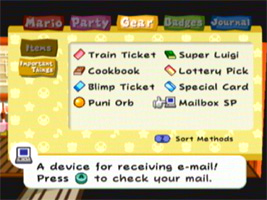 Mario will receive occasional email messages from characters in the game on a little device called the Mailbox SP. It is based on a silver Game Boy Advance SP. The tune that plays when you receive an email is the title theme from Super Mario World. During Chapter 3 the music changes to the Ice Land music from Super Mario Bros. 3. During Chapter 3, during the Glitz Town battles, you have to reserve your fights on wall-mounted computers that resemble distorted versions of the original Game Boy Advance. In the Rogueport Pianta Parlor you can play a variety of minigames. On the right side of the room is a large computer, modelled on the original Game Boy, where you can check scores and rankings. Also in the X-Naut fortress, you come across a yellow disk that you have to use in Grodus's computer. The disk is a Famicom Disk System disk, and when you use it in the computer, the monitor shows the Disk System BIOS loading screen, where Mario and Luigi fight over a lightswitch. At certain points in the game you will take control of Bowser. Three of these sections are based on levels in Super Mario Bros. The first is based on an overworld stage, the second on an underwater stage, and the third set in a castle. Bowser can smash enemies, blocks and pipes. If he grabs some meat he grows and if he takes a hit from an enemy then he shrinks. In the X-Naut fortress, head to the 2nd level and spring jump into the room with a vent in the ceiling. Head right to a grate and hold R to fall through it into a changing room. When you open the curtain the Super Mario Bros. theme will play, and Mario will have changed into an 8-bit sprite. Better still, your partners also change into new 8-bit sprites. You can circle through them all on the Partner menu. After Chapter 6 you receive an email from Zip Toad. 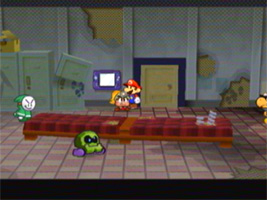 Check the picture and in the background you can see Jr. Troopa, the miniboss from the first Paper Mario. After you complete the game, return to Poshley Heights. South of the museum you will meet Lady Bow and her butler from Paper Mario. 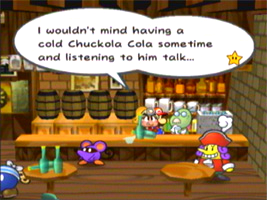 If you use Goombella's Tattle ability on Podley, the innkeeper at the Rogueport Inn, she says she'd like to sit down with a Chuckola Cola and listen to him talk. Chuckola Cola is first mentioned in Mario & Luigi: Superstar Saga. When you land on the floating city of Glitzville, use Goombella's Tattle ability on Stewart, the Cheep Cheep blimp operator. She will describe how Cheep Cheeps have been around in the Mario Bros. series for a long time - and then makes a self-referential gag about breaking the "fourth wall" by talking about the games from an outsider's perspective. There are two Emblem Badges to find: the L Emblem can be found in the rafters of Poshley Heights museum, and the W Emblem can be bought from the trader in Rogueport. They change the colours of Mario's clothes to match Luigi's (green/blue) and Wario's (yellow/purple) respectively. However, if you wear both the L and W Emblems at the same time, Mario's clothes will change to Waluigi's purple/black colour scheme. If you talk to the parrot in Creepy Steeple a few times, he will say "Shine Get! Shine Get!". This is a reference to the Japanese version of Super Mario Sunshine where the Engrish phrase "Shine Get!" would appear on collecting a Shine Sprite. The phrase was edited for other regions, but it became well known on the internet. 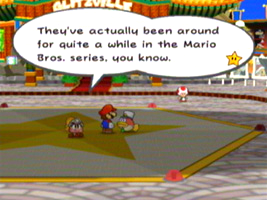 At various points in the game, reference is made to Mario's original name from the Japanese version of Donkey Kong, before he was renamed Mario for the American release. One of the badges is called "Jumpman". Wearing it increases Mario's jump power by 1 and disables the hammer. When fighting in the Glitz Pit, most of the crowd chants your wrestling name "Gonzales", but one audience member shout out "JUMPMAN! Wait, who?". After Chapter 7, Bowser attempts to steal the Crystal Star from the sanctum in Poshley Heights. Pennington accuses him of being a thief, and you can reply with one of three options. One of the options is "Shadow Thief", a reference to Mario & Luigi: Superstar Saga. In that game, Bowser lost his memory and became an apprentice to the Shadow Thief, Popple. Lumpy, the green Ratooey that resides in Rogueport, says he wants to go to Dry Dry Desert to strike oil and make his fortune. 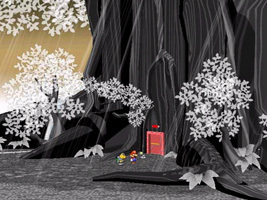 Dry Dry Desert was one of the regions in the first Paper Mario.